Imagine a place where the sea and sky hypnotize adventuring souls. A blue oasis where the sun wraps each day in brilliant white and the ancient moon charms every starry night. Nestled in the cosmopolitan island discovered by jet setters are the bungalows of Grecotel Mykonos Blu thoughtfully designed to reflect the cubist lines of the Cyclades. 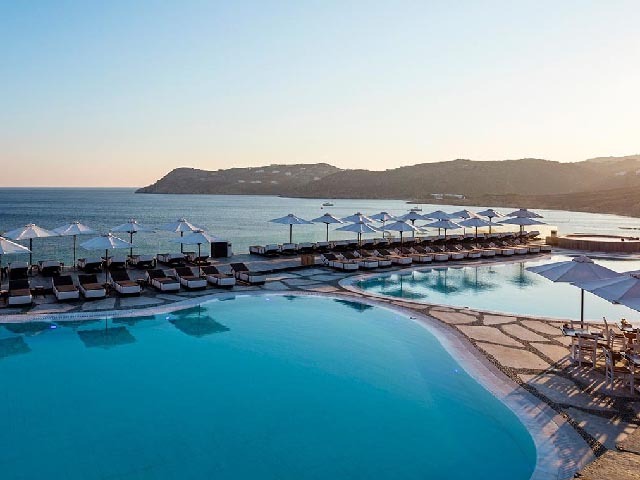 Indulge in sumptuous lounges, enjoy island food in the Poets of the Aegean - one of the country’s finest restaurants, rejuvenate in the Elixir designer Health Spa and the exquisite infinity pool. The 103 whitewashed and stone bungalows and suites, some with private pool, are adorned with natural fabrics in absolute white and blue. You will find the stunning views from your uniquely appointed room both inspiring and breathtaking. 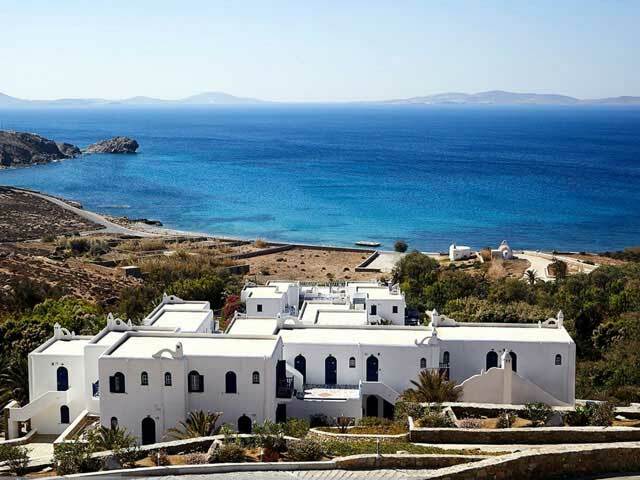 From Mykonos Airport to Grecotel Mykonos Blu Distance 3.2 km about 5 mins.Head south 2.2 km,turn left to Platys Gialos 1.0 km,The Mykonos Blu Grecotel Exclusive Resort will be on the right. The 103 whitewashed and stone bungalows and suites, some with private pool, are adorned with natural fabrics in absolute white and blue. You will find the stunning views from your uniquely appointed room both inspiring and breathtaking. Indulge your palate with sumptuous island food served in the luxurious surroundings of the Aegean Poets. Strike a casual note at the poolside Brasserie LArchipel with its farm fresh menu or enjoy light lunches, creative cocktails on exclusive Psarou Beach with superb Mykonos Blu beach service. Intuitive service transforms your villa into the perfect backdrop for a candlelit dinner for two. Aegean Poets:MEDITERRANEAN CUISINE Aegean Poets employs the true Mediterranean principles of clean, elegant and fresh flavours, based on Greek traditions with undertones of Italy and France. It connects to the outdoor life through large windows and enchanting verandas with panoramic sea views. "Aegean Poets" is open for breakfast, a la carte lunch and dinner with delicious Greek and seafood specialities. Breakfast is served until 12:00 on weekends and during the month of August. Children's meal on request. L Archipel:ONTEMPORARY CUISINE OVERLOOKING PSAROU BEACH L Archipe brasserie is an expression of fine al fresco dining in a place of outstanding beauty. Enjoy contemporary seafood and a taste of the Mediterranean in a location which will stir the emotions. "L’Archipel" tempts the most determined sunbather with delicious Greek flavours as the aromas of island food waft over the poolside veranda which overlooks the famous Psarou beach and the jetsetters’ luxury yachts that dot the horizon. CONTINENTAL BREAKFAST IS SERVED UNTIL 18:00 PM. Delos Lounges:ROOF TOP BAR Breathtaking views, impeccable service and sumptuous décor are the keys to the success of the Delos Lounges. Overlooking the pool, the gardens and famous Psarou Beach. Sip an ouzo or champagne as the sun sets or enjoy an after-dinner drink before heading off into town to get a taste of the island’s famous nightlife. Hello Beach:SUPERB, FULL SERVICE PSAROU BEACH Enjoy the dazzling Aegean waters at the world-famous Psarou beach. The most popular place to celebrate an invigorating dive or simply relax in the warmth of the Greek sun lying on the comfortable chaises longues. Refreshing drinks and a light snack menu are available throughout the day. 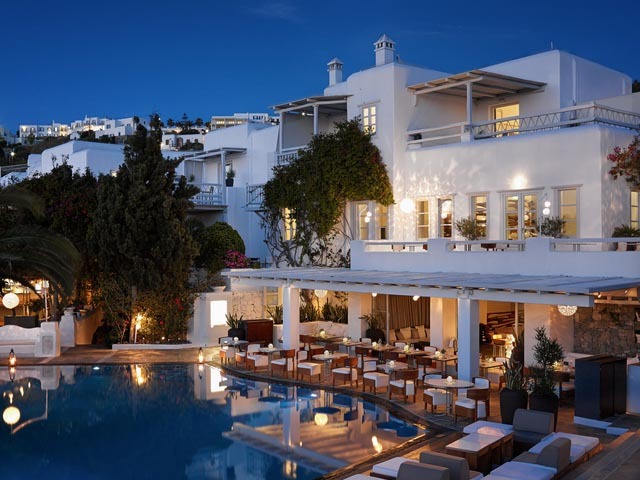 Special dining Mykonos Blu Luxury 5star Hotel:Whether it’s pre dinner, social drinks, snacks, private dining, watching the sunset, lounging poolside or on the beach, there’s nothing more special than being able to enjoy a personalized dining experience with one of our options. Gastronomic delights are wonderfully prepared by professionally trained staff, ranging from fresh seafood to European delights. IN ROOM - VILLA DINING:Intuitive service transforms your villa into the perfect backdrop for a candlelit dinner for two. Dining can be arranged in the privacy of your villa. It can be as formal or as casual as you wish. All details will be taken care of, from dedicating a waiter to serve you throughout the night, to creating a romantic atmosphere. VILLA BBQ:A BBQ can be arranged in the privacy of your villa, a chef and waiter will tend to everything. ROMANTIC DINNER ON THE BEACH:Enjoy a romantic sunset dinner on the beach including a private waiter, personalised menu planning, a romantic beach location, imaginative décor and memories to last a lifetime. FAMILY DINNER ON THE BEACH:Enjoy the company of your family at a private dinner on the beach, which includes beach-style seating for up to 12, and torches. One of our chefs will prepare your chosen menu. Flowers and entertainment can be arranged to enhance your evening of fun, relaxation, and merriment.